B.R. 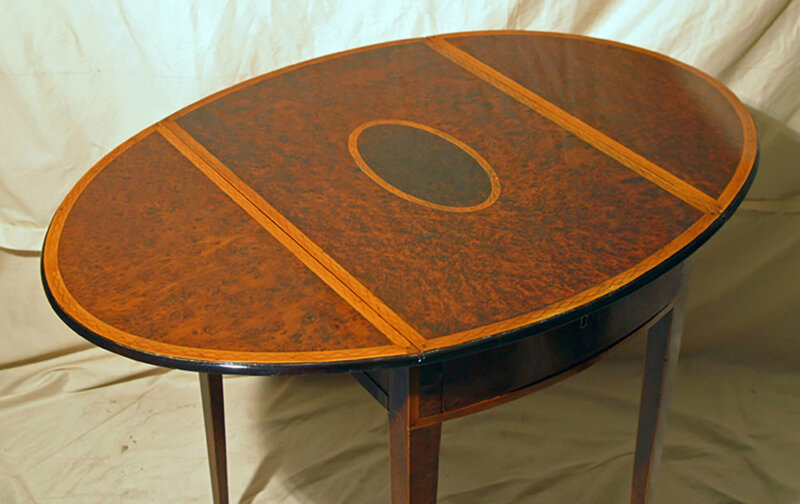 Howard was contracted by a private client to conserve a Federal Pembroke Table that had sustained damage. The lightly constructed table had folding leaves designed for occasional use. Typical of this style or form, the table had two drawers. 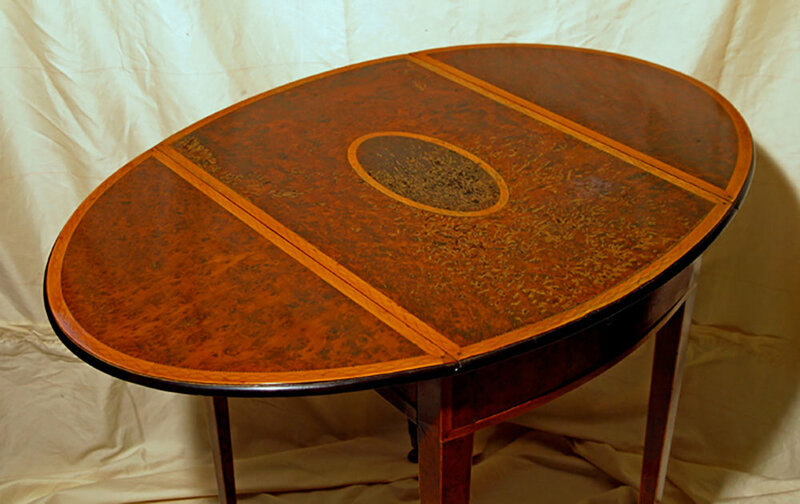 The table top and upper surfaces of the “leaves” were veneered with burled walnut and American holly stringing and was set on gilt brass castors. The synthetic cellulose nitrate varnish, used during an earlier restoration, had lifted from the veneer and allowed water to permeate the wood. Staining or darkening of the veneer had occurred in these areas but was most obvious where the water caused staining of the light holly stringing. Separation of the varnish layer from the wood produced opaque areas which appeared lighter than the underlying walnut burl. Small areas of veneer had become loose and had lifted from the mahogany substrate. The areas of lifting veneer were re-adhered using hot hide glue and clamped overnight. Repeated attempts to consolidate or re-solubilized the old varnish were not successful; therefore, the non-original finish was removed. Where possible, the dark staining was locally reduced or lightened. 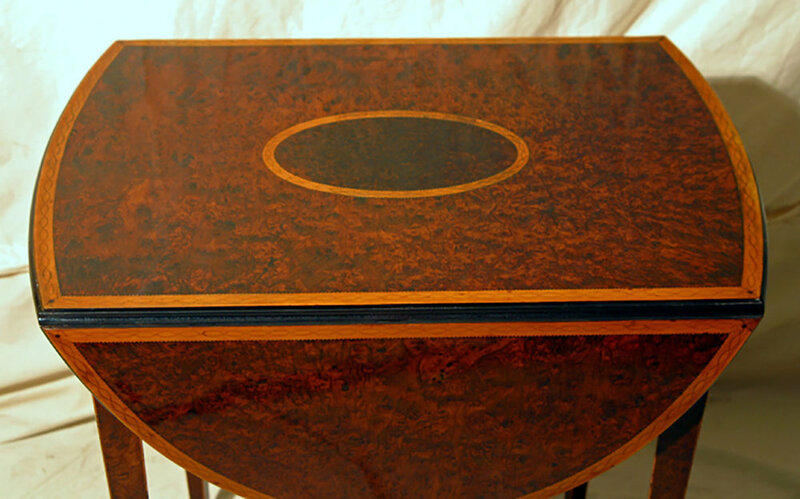 A modern synthetic varnish was toned using aniline dyes to match the slightly yellowed lacquer that had been applied during the earlier refinishing. The toned varnish was spray applied to the table top and hand rubbed to match the sheen found on the folding table leaves. All surfaces were waxed using an unbleached microcrystalline wax and buffed using soft cotton cloths. The leaves were re-attached using original hinges and hardware.